This film is set in the sky, where clouds make human and animal babies. After the clouds make the babies they wrap them up and give them to their stork that delivers the package. The storks deliver all sorts of things like cute puppies, kittens and human babies. 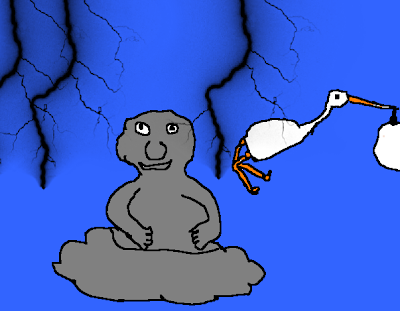 But there is one grey cloud that doesn't make the most pleasant babies, and his poor stork hates delivering them. He has to deliver things like baby crocodiles that keep biting him, hedgehogs whos prickeles poke him all the time, and rams who keep hitting him while he's flying. Finally the stork can't take it anymore and leaves his cloud man for another one. The grey cloud is sad and very angry, but then he realizes that his stork wasn't leaving him he was just getting some protective gear to survive his horrible flights. I rate this movie 10/10 because it is funny,and even though there is a problem it is a happy ending. This sounds like a movie I have watched before. I thought it was funny too. That must hurt being bitten by a crocodile. Anyway good work. We made it to the Courier! !